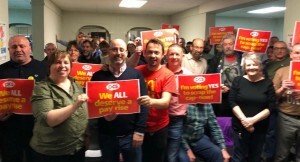 NSSN 364: PCS members vote YES in pay ballot! 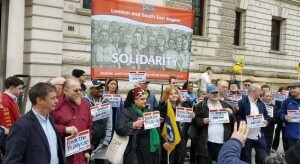 PCS members vote overwhelmingly to back campaign of action on pay (7 Nov) – A decisive yes vote by tens of thousands of PCS members in our consultative ballot on pay sends a powerful message to the government to act to scrap the 1% public sector pay cap and fund above inflation pay rises. Do you agree that the pay cap should be scrapped; and that funds should be made available to provide you with an above inflation pay rise? If the government refuse to scrap the pay cap, are you prepared to take part in industrial action? On the first question 98.9% voted yes, while on the second question 79.2% voted yes. Overall there was a turnout of 48.8%. We will receive a breakdown of the vote in a couple of weeks in time for our December national executive committee to consider the result and plan what we do next. We will be looking to work with other unions to develop a united campaign across the public sector for fair pay for all. We will propose a united pay strategy at a meeting of the TUC’s public sector liaison group on 4 December. In the meantime, you can strengthen the pressure on chancellor Philip Hammond to scrap the cap and fully fund pay rises in the budget on 22 November by using our pay calculator to see how much you’ve lost because of the cap. You can then email your result to the chancellor. The government must act now on pay – and we must keep up the pressure. 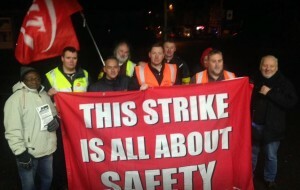 There was an excellent NSSN Solidarity Forum on October 28th in Birmingham. Buy the book ‘Blacklisted: The Secret War between Big Business and Union Activists’ Author: Dave Smith and Phil Chamberlain. Blacklisted tells the controversial story of the illegal strategies that transnational construction companies used to keep union activists away from work.